if you lay the right foundation." Bringing your new cat or kitten home to a household that already has another cat or cats could take a little more effort, depending upon all the personalities involved. Just as when you bring a new kitty to a home without other animals, you must set up a safe place for your new cat in a mult-cat household. As a matter of fact, the safe haven is even more important for your new kitty in a home with more than one feline. Let your new family member get used to her safe haven and feel comfortable there before you introduce her to the other animals in your home. You can also use a little Rescue Remedy to help in reducing the stress of the newbie or your resident feline. Felines are very territorial animals. Providing a safe haven for your new cat will not only help her adjust to her new environment, but will also help the resident cat(s) in your multi-cat household, as well. In all likelihood, your resident cat will know that another cat has been brought into her home, into her territory. Keeping the cats separate will allow them to slowly get used to each other's scents before their first face-to-face meeting. First Face-to-Face Meeting—The "Sniff Test"
When it seems that your new family member is comfortable enough in her safe place, it's time to crack the door open a few inches and let your new kitten or cat and resident cat sniff each other. Watch them interact like this for about a half an hour. The responses will vary from cat to cat, so your supervision is important to ease the transition in your multi-cat household. 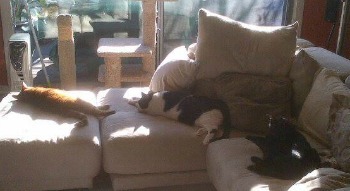 A little hissing or batting at each other is normal behavior in a new multi-cat household. But if one or both of the kitties gives a very intense hiss or growl, or if they swat at each other, close the door. Never punish your cat or kitten for aggressive behavior towards another cat. This will only make her more stressed and upset and will prolong the aggression in the household. Just close the door. Repeat this process until the visits become calmer. One way to help break the ice and help your cats to get used to each other in your multi-cat household is for you to use an interactive cat toy and play with your cats together. You can also give healthy cat treats to each cat on either side of the door. Another helpful thing to do is to switch their bedding so that they get used to each others' scents. Take it slowly and let your cats set the pace. Garbo, Rufus & Dusty on "Cat Furniture"
If the supervised "sniff tests" are going well, it's time to open the door and let your new kitten or cat come out and explore. At the same time, your resident feline can go into your new kitty's safe haven and explore. These excursions into each others' territory should be supervised by you and fairly short in duration, perhaps a half hour at a time. If things seem to be going well, the time can be extended. Ideally, this can be done several times a day with your new cat retreating back to her safe space to process the information. This gives your resident cat the same opportunity to process in her own territory. At first, they may not seem to be getting along so well. This adjustment period can take from two weeks to two months, and sometimes even longer. Some "fighting" is normal as your cats work out their territorial issues. Be patient and try not to interfere, unless it seems that they may hurt each other by drawing blood or if one cat seems to be continually chasing or dominating the other. If your cats are seriously fighting and are in danger of hurting each other, use a squirt bottle with water and spray the cat who is acting overly aggressive. If you don't have a water bottle handy, a loud clap of your hands can do the trick. Don't put yourself in the middle of a cat fight, as you could get seriously hurt. Remember, some hissing and batting is normal and you should let them work it out. Only interfere if it seems that someone could get hurt. And don't punish your cats for any aggressive behavior they express towards one another. Punishment will only make it take longer for them to feel comfortable with each other and in your (their) home. Just separate them and try again later. Best Buddies or Tolerant Roommates? 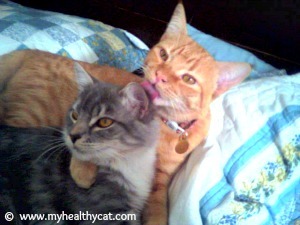 With time, your cats will get used to each other and some may even become the best of friends. However, you should also be prepared for the possibility that your two or more cats may only learn to tolerate each other and never become best buddies. Feline's personalities are somewhat like people personalities, and there is no guarantee of how your cats will get along in a multi-cat household. But if you are patient and take the process slowly, you're doing the best you can to help your cats get off on the right paw. Cat Names - How to choose a name for your new cat or kitten. 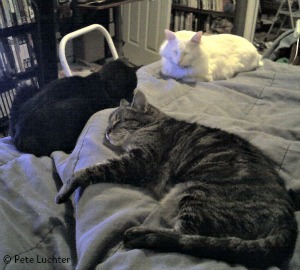 New Cat Article - More information about bringing home a new feline companion.